Ritual and tradition are powerful forces, both for good and for ill. Such it is with me and chowder. I grew up eating chowder, all sorts of chowder, really, but my mom’s is the best. 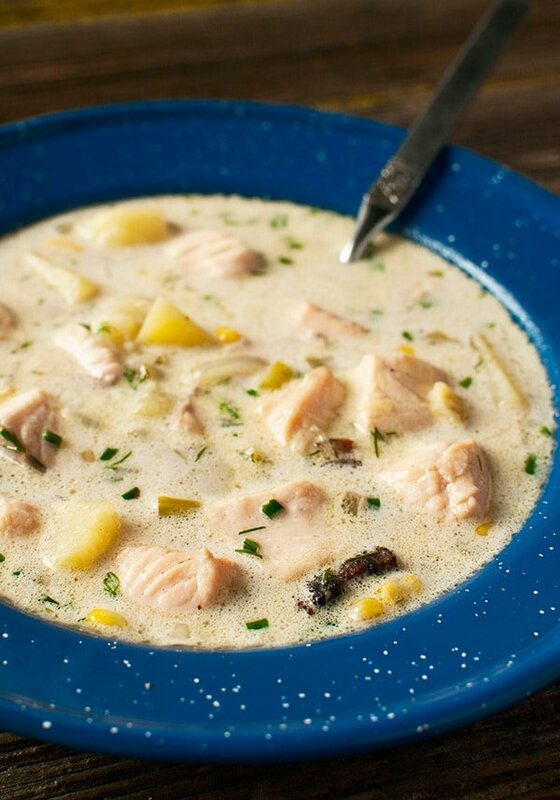 It is a brothy, Maine-style clam chowder that is always made from the same ingredients. always in the same way. Any deviation is apostasy. Needless to say I developed a taste for this sort of chowder, no matter if it’s made with clams or fish or whatever. Sure, I like Manhattan “clam chowder,” but I view it as more of a perfectly nice clam soup than a proper chowder. There is also a Rhode Island style chowder with no tomato or dairy — also a lovely soup, but not a chowder. There is, however, one incarnation of chowder I loathe: It is that hideous, gloppy monstrosity a particular set of New Englanders are known to concoct, mostly I suspect for Midwestern tourists. And I say “Midwestern” because I recently had a version of this chowder in Minnesota that was so thick you could stand a spoon in it. I am gagging just thinking about it; apparently this is how many in the Midwest like their chowder. Gak. It should be pretty clear to you by now that I am, well, a little opinionated about what is and is not “chowder.” I blame my family, but they shouldn’t feel bad about that; like I said before, sometimes ritual and tradition are good things. My first tentative steps to break that training came earlier this year, with a perch chowder I designed specifically for the Great Lakes region. It’s made with yellow perch and Polish kielbasa and is damn good if I say so myself. 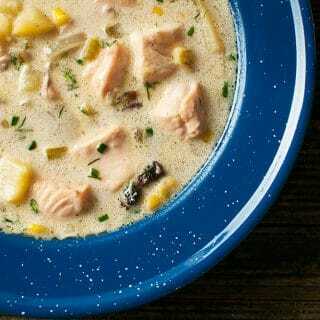 This salmon chowder is my second step. I should start by saying that what you see in the picture is not, strictly speaking, a salmon chowder: It’s made with a steelhead trout. Steelhead is very close to salmon, although it is a little leaner and a lot paler (unless you are working with pink salmon, which is the same color). Any salmon, char or trout you feel like using will work here. I live in Northern California, where the chinook salmon is king. This is the very southern end of its range, and what, ecologically speaking, could be called the Pacific Northwest — and it is the Pacific Northwest, with its vast salmon runs, trout in the mountains, steelhead in the rivers and char in the snowy North — where I drew my inspiration here. 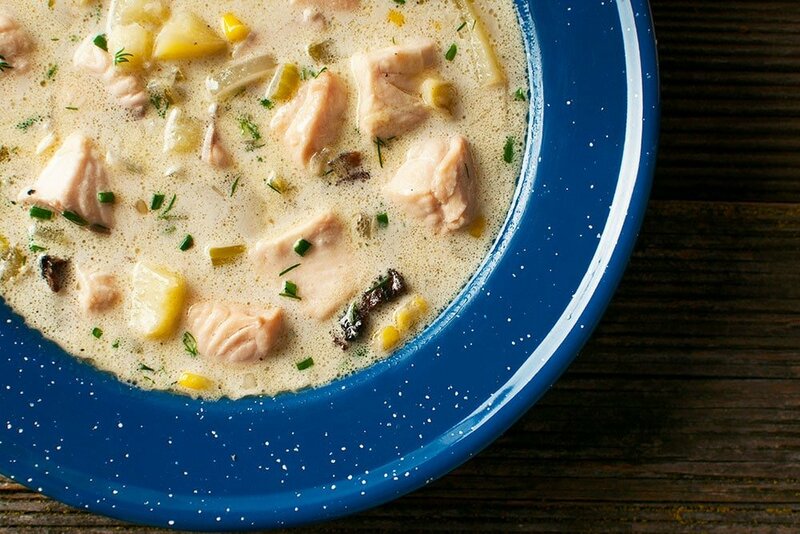 This salmon chowder has bacon, corn, lots of herbs and a homemade stock. None of this would fly in mum’s clam chowder. But here’s the thing: People move West to escape tradition, to be free to be whomever they wish to be. Why can’t their chowder follow suit? As I mentioned, you can use any salmonid fish for this recipe... actually, you can use any fish -- except for something like sardines, mackerel or bluefish. What makes this chowder great is the broth you make from the heads and bones, and while you are perfectly OK making this with store-bought stock, it will not be as good. Serve with crusty sourdough bread and a hoppy beer or crisp white wine. Oh, and this chowder is actually better the next day; just heat it up very slowly on the stovetop. Don't let it boil. To make the broth, bring a large pot of water to a boil and salt it well. Add the salmon bones, heads, etc. When the water returns to a boil, let this cook 1 minute. Remove the salmon bits (save them!) and discard the water. Blanching this way removes the scum from the stock and will give you a cleaner-tasting broth when you are done. Wipe out the pot, add the oil, and turn the heat to medium-high. When the oil is hot, saute the onion, carrot and celery, stirring often, until the onion is soft, about 4 to 5 minutes. Add the wine, bay leaves and the dried mushrooms and use a wooden spoon to scrape up any browned bits from the bottom of the pot. Let the wine boil for a minute or two, then add the blanched salmon bones and enough cool water to cover everything by about 1/2 inch. Bring to a very gentle simmer (barely bubbling) and cook like this for 45 minutes. Get a large bowl for the broth and set a strainer over it. Line the strainer with a plain paper towel or cheesecloth. Turn off the heat on the broth and ladle it through the strainer and into the bowl. Don't bother trying to get the last little bit of broth out of the pot, as it will be full of debris. Discard the contents of the pot and reserve the broth. To make the chowder, melt the butter in a Dutch over or other soup pot set over medium heat. Add the bacon and fry, stirring and turning often, until crispy, about 6 to 8 minutes. Add the onion and celery and saute until soft, about another 4 to 5 minutes. Add the potatoes and the salmon broth and being to a simmer. Add salt to taste. Cook until the potatoes are tender, about 15 to 20 minutes. When the potatoes are tender, add the corn and the chunks of salmon. Cook gently until the salmon is just cooked through, about 5 minutes. Turn off the heat and stir in the dill, heavy cream and black pepper. You can find dozens of salmon recipes here on Hunter Angler Gardener Cook! Anyone done this with hot smoked salmon? I was thinking of just adding in my own smoked salmon (12hr brine/5hr smoke) at the end. Thought I’d make it a day in advance to let all of the flavors combine. Thinks this will work day?